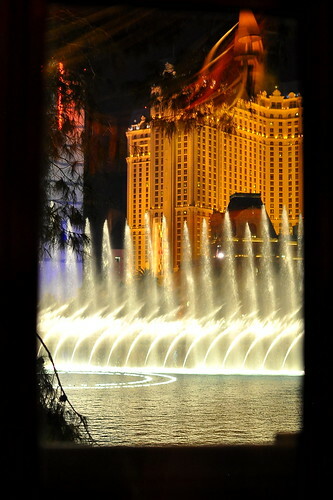 An irresistible invite from Bellagio brought The Astronomer and me to Las Vegas for a weekend of dynamite wining and dining. 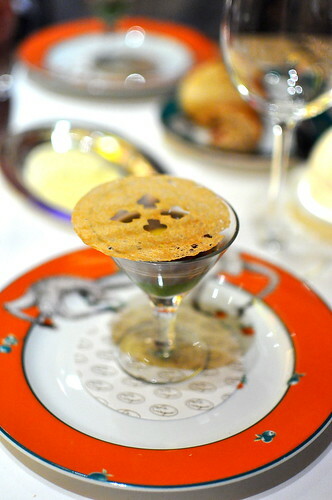 After arriving at the hotel, checking into our room, and dropping off our bags, we strolled over to Sirio Maccioni‘s famed Le Cirque for a late-night supper. Le Cirque, which opened 38 years ago in New York City, made its Las Vegas debut at the Bellagio in 1998. 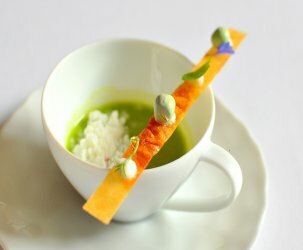 The restaurant is the recipient of the AAA Five Diamond rating, as well as one Michelin star. 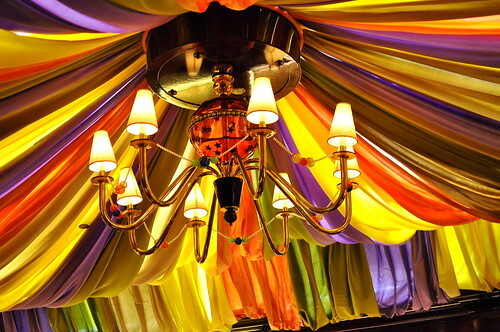 Set under a plush circus tent, Le Cirque’s elegant and lively dining room felt miles away from the din of slot machines. In a city where bigger is generally regarded as better, this intimate space felt like a real treat. Whereas New York’s Le Cirque is set among skyscrapers, this location is perched lakeside, overlooking the hotel’s famous fountains. Every fifteen minutes, The Astronomer and I were entranced by the dancing water and shimmering lights. It felt quintessentially Vegas, and maybe a little cheesy, but we loved it anyway. 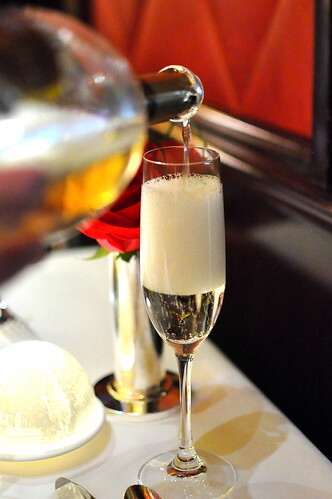 Le Cirque’s sommelier poured us glasses of Ruinart champagne while we waited for the first bites to arrive. Bubbles! 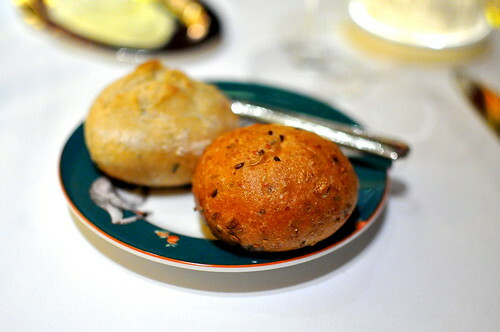 …while The Astronomer chose a rosemary roll and one with seeds and dried fruit. 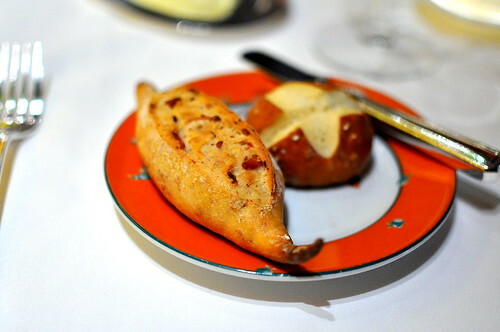 All of the breads were most satisfactory, especially when buttered up generously. 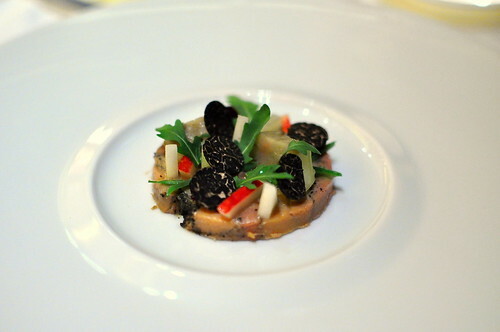 The first dish to arrive was an amuse-bouche consisting of a quail egg au plat with an asparagus puree, Ibérico ham, and black truffle emulsion. We were instructed to crack the paper-thin cracker and dig in with a spoon. The three-bite wonder was rich, savory, and left us wanting more. Next we were treated to Langoustines au Caviar. 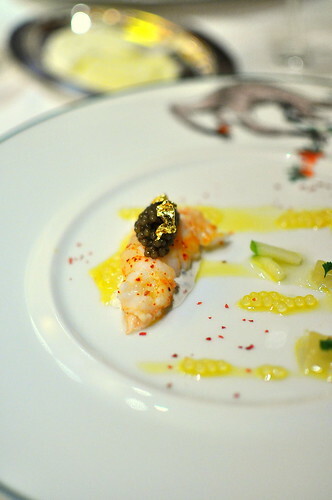 The citrus-marinated langoustine was topped with Ossetra caviar and a bit of gold leaf. 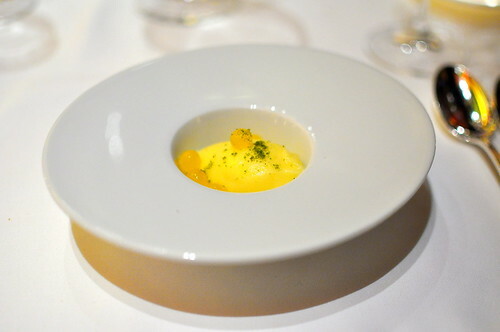 Accenting the sweet and briny seafood were tapioca pearls, green apple, and passion fruit. It was a light, bright, and well composed plate. My favorite course of the evening was La Terrine de Foie Gras. Rather than pairing the liver with fruit or something equally predictable, Chef Pugin chose an array of seasonal vegetables including radishes, beets, and arugula. Eaten with the country bread served alongside, the foie gras, black truffles, and winter vegetables played off one another just right, creating a flavor profile that really clicked. 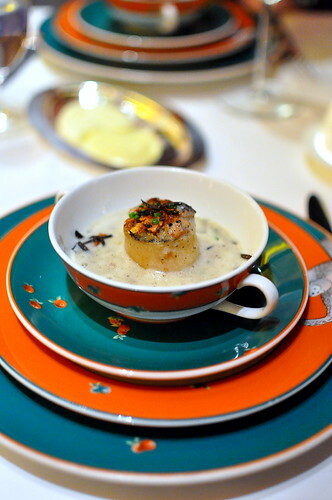 A jumbo scallop, perfectly seared and adorned with black truffles, was the next course on the scene. A creamy broth laced with additional truffles was poured into the saucer at the table, adding an element of drama to it all. While the centerpiece was absolutely plump and delicious, my favorite element of the course was the stack of colorful plates it was served on. Honestly, I couldn’t get enough of those playful monkeys. 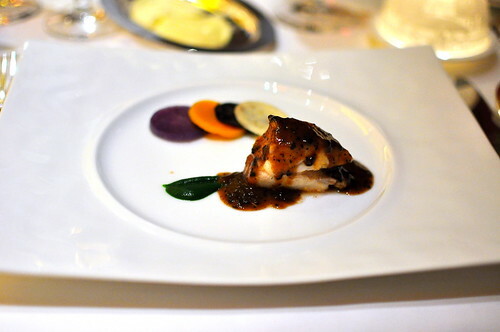 The penultimate savory course consisted of a hunk of turbot sauced with even more black truffles and paired with a rainbow of celery root, black truffle, butternut squash, and purple potato. It was a solid fish preparation, but not as squee-inducing as the courses that preceded. For the final course of the night, Chef sent out his signature dish: Bucatini Timbale. 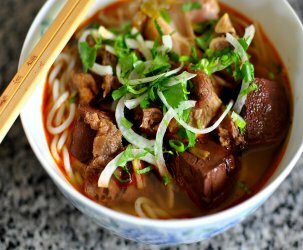 According to the general manager, this dish takes days to prepare because each noodle is painstakingly molded to form the proper, rounded shape. 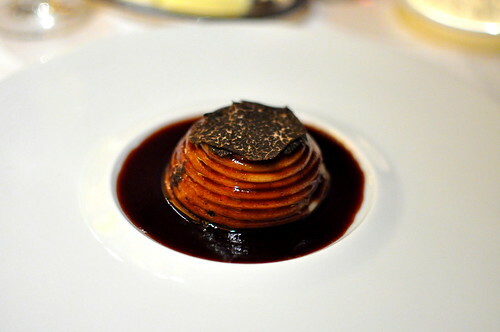 The resulting bucatini beehive is filled with a Kobe beef oxtail ragu and topped with Périgord truffles and a shiny Daube sauce. 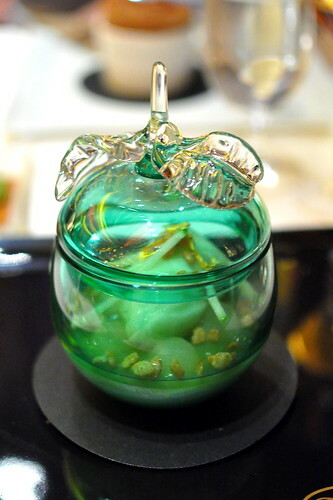 The presentation was a thing of beauty, while the flavors were unbelievably bold. Transitioning our palates from salty to sweet, we indulged in the most refreshing mandarin orange sorbet with mandarin orange spheres and a dusting of kaffir lime. 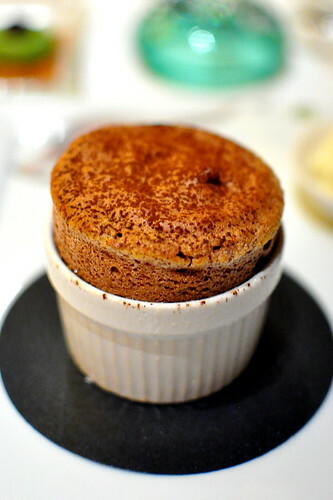 I was presented with a classic chocolate souffle served with vanilla ice cream on the side. It stood impressively tall and struck the perfect chocolaty note. And finally, we were served a small plate of mignardises. 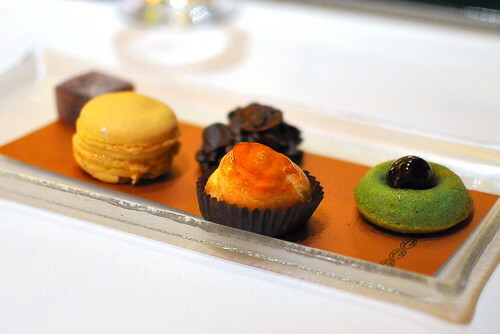 From left to right: strawberry gelee, passion fruit macaron, almond slivers enrobed in dark chocolate, croque em bouche, and amaretto cookie with a candied cherry. 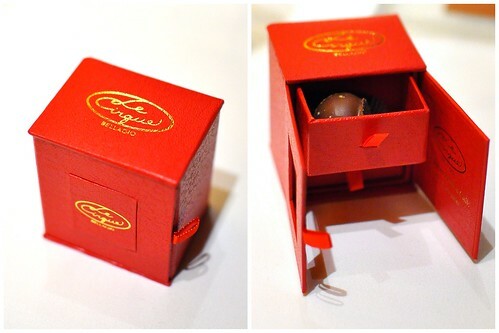 They sent me home with the cutest red leather box filled with chocolate truffles. I melt just thinking about it. Circuses are playful, daring, and roaring places that dazzle crowds and suspend disbelief. 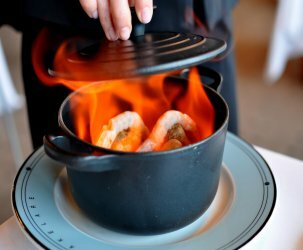 Inspired by everything under the big top, Le Cirque delivered a spectacle of a meal, one that was as whimsical as it was delicious, as thoughtful as it was fancy. Do stop by on your next trip to Vegas, and don’t forget to ask for Ivo. That Bucatini Timbale looks and sounds divine! You have the best dining experiences! I’m so sad I didn’t have enough time during that weekend to even make it to the Bellagio or see the fountains, which I love. 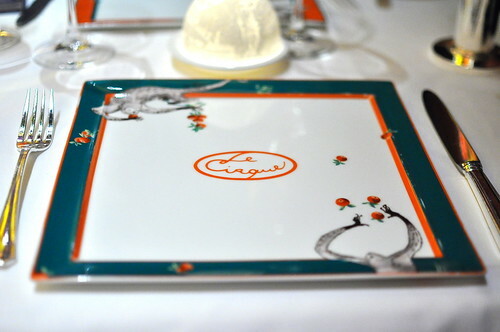 Le Cirque has been on my list. Glad to hear you had such a good experience. I want to eat this post just looking at your pictures! Also, those colorful plates are something I must have. Wow… Bucatini Timbale… my new MUST EAT SOON dish! Great post. Makes we want to hop in the car for Vegas right now! Now that’s an elegant dinner… lovely! Mary – By producing quality content on this site, I imagine.